Released in May 2004, the third installment is widely considered the inferior of the three; originally designed by Looking Glass Studios, the series was picked up by Eidos's Ion Storm studio. A new 'body awareness' engine is implemented, as well as an optional third person perspective. The infamous 'City' now features as a free-roaming locale with sidequests and thievery opportunities. A few years on Garrett is once more drawn into the Keepers' plans. Can he stop a new Dark Age? Is there anyone besides himself he can trust? He'll need to sneak and steal to uncover the ultimate truth. Best 100% time on Expert: 1:31:15 by Daniel 'CannibalK9' Burns on 2006-02-25. Thank you as always to Radix. And to CyricZ on Gamefaqs for his awesome guide which even gives a dramatic script for each cutscene (see it if you want some more storyline). I didn't use his routes as far as I know, but it was an excellent read regardless. Also to senornacho for his handy Loot Guide that I used throughout. Finally to everyone who offered support and I suppose also to my granddad, for getting bored with the game and giving it to me. I ran this game firstly because it was there and it was the only pc game I felt I could do. I also thoroughly enjoyed the Splinter Cell series, and this seemed similar. The freedom to dash haphazardly through the level and still get 100% are what differentiates them the most for me, so that was the focusing aspect rather than slowness as in SC. There were also several threads about the game which didn't seem to be going anywhere, so I took it upon myself to finally get this game done. The decision to do Expert was primarily because of the thread title, but it's also a sense of 'why the hell not' since Expert needs 90% of the loot to complete. Then again - the speed run was basically my first time playing the game or the series, so Expert was a big step! Expert also features more enemies who do more damage, take less and see you more easily. You're also not allowed to kill non-combatants. Fun! 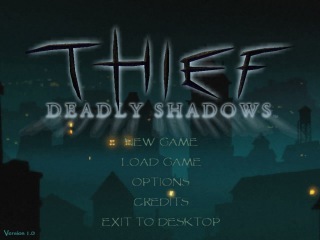 Lastly, this game is phenomenally different to at least the first Thief; from what I've seen it was basically a First Person Stealathon, which even had bunny-hopping and all the general fast-paced craziness you'd expect. This latest game actually has a person rather than a pair of speedy eyes, so movement is much harder generally (especially climbing-wise). Also the enemies are much better at hitting you (but still not good enough =D). The major oversight is that passing through portals to other areas leaves the previous area exactly the same, so all the guards are just as irritated as you left them if you need to backtrack. I take care to reduce this and therefore reduce my own frustration, and for the most part succeed! FRAPS likes to crash my computer if it's recording when a load screen starts, but I can keep 100% of the run in due to the menu before each load screen. I cut out all cutscenes too. For those who don't know, locks can be picked by pressing the WASD keys, and the hotspots are always on the 8 compass-points (except a few out of the way ones). Combined with rapidly pressing the left-mouse button and learning them off-by-heart, they go very quickly. My only method of stealth is crouching. It is reasonably quick, silent, and has the dual-purpose of being used in low spaces. I reconfigured it to the middle-mouse button for easy use. 100% loot is only recorded during missions. There is plenty of loot in the city but it is in a huge number of places, regenerates everyday and there is no way to tell what I have got so it can be safely ignored. The same goes for the dust mites and cornerstones, I suppose they could be counted but they do not benefit you in any way outside faction status, which is more a matter of preference or security than a collectable. I also highly recommend against the low quality version unless you have no choice. The video quality is poorer, but more than that the loot collection noise sounds extremely 'tinny'. Personally it drives me insane. -I love that first arrow. They arch donchaknow. Putting out the fire signals the cook to open the top door which I use to exit the level. I actually enter through a side door and rob that room while the guard stands there looking idiotic. Then I take out the secret area and narrowly avoid an arrow from the guard. I enter through the upper portal because it is easier to get down than up in the next area. -I then head for the tall tower, and you can see that jumping up stairs is always faster. I take a fairly bizarre route upon leaving but it works to reduce backtracking. When I jump down into the courtyard there is a chance of loosing the majority of my health for no reason, forcing a restart. I then simply pass through the dining areas and exit through the lower portal because, as I stated earlier, the guards are in exactly the same place and just as riled as when I left them. -I head into the safe to get my opal, while a fluke causes the guards to be in perfect position for a little blackjacking. However, the guard in the next corridor has moved (leaving a random non-combatant in his place), so I run on confusedly. But another guard has also wondered off so it's quicker overall, even though I take ages to grab that loot on the statue and use another flashbang. I then exit through the top, nabbing the last bit of loot on my way down. (I was still fairly new to the game and almost got lost. Not much slower but still overly frantic.) I begin in Garrett's apartment, pick up two flashbangs (without picking up a broom, yay) and head out. First time in the city and I need to run some errands. I try to sell my new opal at the local fence but he won't take it, so I head to Stonemarket, passing by some hostile thugs en route. After I'm done I receive a letter from The Keepers, so I waltzy on over. The cutscene that I skip shows them asking me to collect 'The Builder's Cup' and 'The Jacknall's Paw' for undetermined reasons with promise of access to their prophecies. Who am I to say no? I go to the church first because it's closer. -The main doors are a bad idea so I kill a guard and make a tricky entrance through the side. He drops loot, and the only way to get it off them is to pickpocket them when they are unaware or floor them so they drop it. I clear the top floors so I can backtrack through the lower levels and collect all the loot. The East Wing is a pain to plan out; in the end I went the way I do because I cause less commotion entering and I need time to get all the loot in the first room. I then pass through knocking out guards and carefully allow one to sleep until I leave because he uses magic - which hurts an awful lot. I considered whether it would be quicker to enter and exit the same way, but my optimised route came out quickest (though I had to use a flash bang). I then run through the main cathedral and for some reason running straight into the High Priest doesn't cause him to mangle you. Upon leaving, I use a gas-bomb I grabbed earlier to knock-out two guards and take the loot one was holding. -The factory is laid out confusingly but is easy enough. After knocking out a spellcaster I flip the switch to incinerate the zombie, then enter the incinerator for some loot. In the engine room I creep unnecessarily, but the guard is highly random and I get past twice with luck. Several items need to be put in various places to lower the cage that contains the chalice, and I leave through a different portal. -This portal takes me right to the exit, so I just nab the last bit of loot and run. -In the inner sanctuary, even making it through the first area without alerting everyone is hard, but through the locked door I make a very nice jump/mantle onto a wooden beam. The route was insanely difficult to work out (also involved me trying to climb an invisible ledge for half an hour), but the breaking factor was the possibility of falling safely into the canal using a hidden ledge. I could have entered the small 'sleepsie' room from the top, but I unlock the door and put out the fires because it is quicker and easier overall (though very close in this run, I barely escape with all my health). I then scoop up the last of the loot and enter the Taproot Cellar. I couldn't have asked this to go better. At the altar the Ent was supposed to continue its patrol and ignore me, but I arrived slightly early and it came to investigate immediately after I had finished the trial of the blood, water and moss. That is an epic escape, at least in my opinion. I then wonder fairly dreamily to the exit where I don't need to go back through the first area to finish the mission. I was still a bit jittery in the menu as you can see! -Zombie Time! I didn't have as much trouble exploring this as I'd have thought, and my decision not to pick up holy water while I was here was a good one. I just weave my way through getting stuck on a ramp at one point, and read the ship's manifest to discover that an item the Keepers are after is in the Captain's mansion. I leave by the ladder (why oh why couldn't I enter here?) and hop across to steal a rowboat. -By far the hardest to plan, there are far less stairs than are useful with numerous routes and dead-ends. There are three ways to enter the main building but only one appropriate exit. I head on up to the top and through the main doors because it gives less dead-ends overall and allows me to enter the inner area from the top after I clear out the ground floor. The library is a necessary backtracking, and I just charge through the building. This took a LOT of retries to get right since the guards can often block the corridors and doorways. I just systematically work my way up, and try and fail to blackjack a guard but he doesn't see me anyway. Once I'm done I go through the portal, but the door before it gets stuck irritatingly. -I put out the chandelier to distract a guard that would otherwise meet me on my way back from the chest. The timing with the guard on the other side of the rotunda is difficult (and is the reason I don't get the loot on the stairs now), and he was facing the wrong way than usual. Oh well. After I've cleared up here I need to go back down but damn; no stairs. It doesn't matter that it takes a while to jump over the balcony because I need to wait for a guard in the lower corridor. I take this chest because I don't have time to get it later. I make my way to the study easily and hit a switch that opens a secret door. I run there but still have to get the loot on the stairs, and I make it through as the bookshelf begins to close, I'm very happy with that timing. Then I simply go down to get my compendium and finally rob the widow of the secret stash from her husband. I'm such a jerk. -These crazy lizard fish things with huge swords will just keep on chasing me so I make sure they don't actually see me here. I found a method of moving quickly through the room with the pagans, collecting the loot including in a locked chest without getting my limbs sliced off. Fluky! Then straight to the next area. -In the library the Kurshok's are preoccupied with a Pagan Shaman so I can make it to the top easily. I run around and finish my main objective, but there's a crown here that Garrett would really like. So I simply dash around collecting loot, at one point the crazy physics turn me around but little time is lost. In the throne room I get the first locked chest before alerting them because flashbangs don't last long enough, then grab my prize and run back to the first area via a more direct route. -Again I can make it back to the entrance a completely different way than I came. I pretty much winged the nursery (with all the eggs), and subsequently I get a haircut from one of the Kurshok. Unbelievably close but still fast. I then leave but not without hearing the giant rats, who sound just like you'd expect giant rats to sound like! (The symbol I make on the menu screen is a question mark, I was reacting to the audio slip-up). Back to the Keepers with my latest trove, and a cutscene elaborates on their decision to once again, do nothing! At some point 'the progress of time will cease and the evil will be pointed out', so Garrett takes matters into his own hands and sets out to stop the clocktower to fulfil the prophecy. If that isn't the poorest excuse to break into somewhere I don't know what is. The entrance is only a short stroll and wall-climb away. -Here we go all the way down collecting loot and avoiding a patrolling guard. In a small hole behind a grate is a candlestick, so I have to wait for the grate to bounce it up before I can get it. I unlock the door and lower the lift to make my getaway easier, then steal more special loot from in front of a Hammerite Priest (a great example of Garrett's thieving ability, he must have invisible extendable arms). I continue down, but the guards end up in the wrong place. In the small passage I was waiting for the guards ahead to run past but they were still talking, whilst the guards behind came up and took off my first damage of the game! In the main control room the only things to note are that I kill the priest because I expected him to be walking towards me (I was too quick getting here). The next guard is alerted when he should already be lying unconcious on the floor, so I flash him. I need to flip some switches (I usually forget at least one of them). There are then a guard and a mechanic I need to pickpocket. The guard is easy but the quickest way to get the mechanic as you can see is to jump directly behind him and steal it before he is alerted. VERY DIFFICULT! Then it's a simple matter of shutting down the tower, taking the time to grab a bottle of holy water before it's over. -There are even more spellcasters here, so I take the first two out with a gas bomb. I collect fire arrows for specific use in a minute, then show the best way to climb a staircase. Once again, the route was difficult, and in the council chamber I sequence break it using a tricky trick that gets me to Orland's office before I should have access. The fire arrow destroys a seal, so I can now use the glyphs again. Since I've done the most out of the way room I can simply circle the building collecting all the loot and exit into the lower libraries. For some reason Garrett wants to know more about this woman. The Hammerite Inspector Drept has a tale of a horrible hag ripping apart his friend when he was in the orphanage; lets check it out! I heal myself and use a flashbang to play it safe since I'm about to re-stock. At his workshop, Drept points me in the direction of the Cradle. As Garrett says, 'It used to be an insane asylum, and before that, it was an orphanage. One night a fire started, no one knows how, and after that they left the place abandoned. If there's a way to cram more misery into one building's history, I can't think of it.' Pretty creepy huh? I buy some more stuff, the flashbangs, gas bombs, gas arrows and health potions are necessary. I needn't have bought the mines but I didn't know that at the time. The Cradle is just down the street. -(Pah, where's a shotgun-arrow when you need one?) There is so much I could say about this mission, but I'll keep it relevant Though I must firstly say that I do not do scary games, this was an unbelievable challenge for me! The first area has no enemies, not that it helps much. I immediately go to the attic, there's knocking from inside but no one there. I start the spirit of the girl talking and grab a battery for the power generator. After a quick scoot around for loot I head to the cellar and start the power, also grabbing her blood and sending it outside. I can't enter the next area till she finishes speaking, so I take the time to get the loot up those steps. -Here we have the 'Puppets'. The desire to obliterate every one of them is strong but I still practiced the level excessively (with loud music on of course), and had a brilliant route by the end. After the observatory, the first one I find behind a locked door I kill with holy water, and I need all three because it's very glitchy. I then call the lift so I can do something else while it descends. After the seclusion chamber I get Lauryl's nightgown and head straight for the morgue's furnace, flashbanging as I go. Now I need to go to the past, and for that I need a 'toy'. I get the viktrola because it sends me to the past in the most advantageous spot. On my way out the Puppets were in weird places so you get to see them jumping out at me, funfunfun! I transport myself in the labotomy theatre. -In the past are the asylum staff, and if they touch me I go back to the present and have no choice but to restart the run. I also have no items since I'm in the body of a patient. I instantly grab the dissolution serum, a very risky tactic, and head off out a different door because one of the staff is guarding the way I came in. I get two pieces of loot here, but only certain ones can be collected in this time (I did not enjoy finding out which. How does he even steal it if he's not in his own body? One of the Cradle's mysteries I guess). The staff after the counter was in the wrong place, that was a very near run-ruiner. In the nursery I get the diary and read some information on 'the hag'. After another close-call in the morgue I head back out. The damage I take falling down the ladder is an example of the random fall-damage that can occur if he hits something on the way down. NOT NICE. -There are now staff in this first area, but if I keep moving they won't bother me too much. I clean off the blood and get myself caught to stop Lauryl talking quicker. I cannot leave just yet, I'll have to pretend to kill myself. Up to the very top I go, and running down the table and out the window would be really stylish if the frame rate hadn't suddenly dropped. Nevermind. There's only one thing I can say after doing this... WHAHOO! -So I pretended to kill myself, but how did he actually survive the fall? Yet another of the Cradle's many mysteries. I'm supposed to follow Lauryl's ghost but she appears in the catacombs if I go straight there, so I do. The cutscene shows Garrett cleaning a glyph off her tomb with her blood, freeing her body from the clutches of, you guessed it, Interpreter Gamall! 'The hag' reverts back to her monstrous form comprised of various body parts and decimates the Keepers in their library. So I now head back there and once again the fate of the world rests in my hands. Five sentient artifacts need to be found in order to destroy the final glyph. I already have the 'Crown' from the Sunken Citadel, but Gamall has stolen the 'Jacknall's Paw' and the 'Builder's Chalice'. I go to Audale and keep my health potions handy while I run straight through the Pagan camp, snatching a talisman in the process. This I use to open the pump room and lower the canal water-level. Now I can enter Gamall's lair. -There are plenty of statues here but no Gamall, so I run through getting the 'Chalice' and using a secret entrance to find the room where she concocts her plans and studies her stolen books. A cutscene shows that Artemus is here and also on her trail. Garrett discovers where each artifact must be placed in the City to bring forth the final glyph, and apparently he's supposed to use it rather than destroy it, as the Keepers wrongly advised. Well now we need to get the 'Paw' and get out. There's a glyph that allows me to destroy the statues with my blackjack, but it's safe to ignore that. The only exits to this room are up the walls (poor design if you ask me), and a statue catches my leg on the way up. Then I just run straight for the artifact and head for the final mission. -Far friendlier than the last mission, I thoroughly enjoyed myself here. However this was second hardest as far as route planning went due to the complex structure and connectivity. The loot also changes depending on whether or not you sell the 'Crown' (which I didn't). There are many many reasons for why I did what I did, so I'll just ask you to take it for granted that this is the best route there is and that it took me an insane amount of time to come up with it. The guards out front have keys to the doors, and the pickpocketing factor is still here so I flash them. I steal another key from the second guard I find inside which opens all the doors in the place. The electric barriers can either be turned off with a power switch or momentarily with a water arrow, so I of course choose the latter and faster. By now you may notice that I seem to be using a huge number of items. Any guard that I may meet later on I knock out with gas, otherwise I use a flashbang to stop them chasing me. One just keeps on chasing me and subsequently alerts more guards. I don't lose much time but it doesn't look too neat. The only sure way of breaking the glass cabinets is with a broadhead arrow. I then pick up the next artifact from behind another barrier. This one is a returning item from the Thief series called the 'Heart'. I then clear upstairs and enter Tesero Hall. -I head West knocking out a guard. At a balcony I fire an arrow at the large (non-animated) statue to dislodge a medallion, then head down to pick it up. I go back the way I came (trust me, it's still faster) and through to the main atrium. The final artifact is here and is called the 'Eye'. From the first game, the 'Eye' is formed from gemstones and GARRETT'S OWN FLESH EYE, which is why he has a mecahnical one to replace it. *There is an odd bug here. I walk to the edge of the balcony to trigger it to start speaking to me, remember it is sentient ('Mommy, my eye is talking to me'), because if I don't and I pull a lever to raise it later, I will be stuck with the objective to head down to the eye and speak to it even after I've already picked it up! Therefore I won't be able to exit the level. This way, the objective is cancelled when I pull the lever and I am still allowed to exit. I skirt round to the North collecting loot as I go. I jump over a balcony, and with difficulty I could have jumped over to the painting without climbing the wall. Since I failed it cost me five seconds or so, but I don't mind because of a trick a bit later. I go all the way up to the Curator's Office and quickly get the loot. I go to the balcony and pull the lever to raise the rotating statue with the 'Eye' at the end. Now for the level breaker... going all the way back down those stairs would take ages and I'd need to backtrack unnecessarily around the edge of the hall. I have a better plan, but I won't spoil it. It is LUDICROUSLY difficult to pull off especially after doing all that, so I didn't mind the odd mistake when it took so many painful retrys. I grab the 'Eye' as soon as it's up and run straight back to the outer museum. I get caught on a guard and almost panicked, but he eventually stumbles out of the way. Again, I don't mind these few seconds since I have saved so much time elsewhere. -I finally run straight outside, collecting the last few pieces of loot for the game as I go. The finale. I climb out of my tunnel and set out for the Keeper library. Suddenly a cutscene shows Artemus. He asks you for the artifacts. Orland appears and explains that the clocktower was not pointing at him but at all the Keepers. They have become unbalanced by power, Orland himself corrupted by his misinterpretation of the prophecy. Garrett must use the artifacts to use the final glyph and allow the glyphs to rule over the world justly. Artemus (actually a disguise) strangles Orland, then shifts form to reveal Gamall in all her icky body-parts horror. Garrett quickly leaves. So it's time to journey around the City with my remaining health potions, putting the artifacts in the correct places, avoiding the chaotic tangle of City Watch, Hammerites, Pagans, Statues and of course, Gamall, who patrols every area that needs an artifact inserting. I jump down from my pearch, sprint straight past Gamall and slam the 'Heart' in place. I make a detour to the Docks to insert the 'Paw', then return to Old Quarter healing as I go. I do get stuck next to a statue, but believe me it's quicker than previous attempts... I almost head back to the Cradle (that would have been great), but revert my course for the Hammerite Cemetary. The spellcasters (one of my main reasons for retrys) cause me no trouble, and I can easily put the 'Chalice' in while Gamall is destracted by the undead. I get blocked again on the way out this time by a Pagan, but it isn't for long. After I've put the 'Crown' at the base of the clocktower I make a bee-line for my final destination, the fountain in South Quarter. By the time I'm there I have no potions left, so I randomly chuck some useless mines and oh so nimbly place the talkative 'Eye' in its indentation. f a d e o u t. . . There we are! Enjoy the bizarre final cutscene! I don't know why Garrett's eye has suddenly gone red, must be magic! For those that don't know and are interested, the dialogue at the very end with the small girl is exactly the same as the beginning of the first Thief, when a young Garrett tried to steal from Keeper Artemus. The story is complete! I am very pleased with this, especially since it was pretty much my first time through. It surely made the game more enjoyable than I could have hoped for and I hope you liked the run! Oh, and thanks for reading all of this (if you did). It is a bit long!